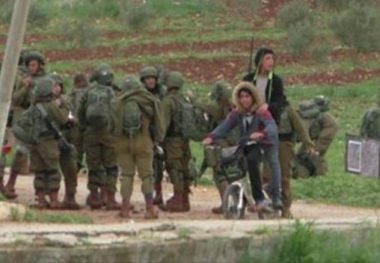 Israeli soldiers displaced, on Wednesday morning, two Palestinian Bedouin families from their homes in Khirbat Ibzeeq village, northeast of Tubas, in northeastern West Bank, as the army is preparing to conduct live fire military drills in their area. The families said they will not be allowed back to their Dwellings from March 7th to March 21st and added that they also heard tank shells in the area, indicating that the army has already started its training. Two days ago, that army notified 16 Palestinian families that they will be evicted from their homes in Khirbat Ibiziq village, under the pretext that the Israeli army will conduct military drills in the area. Khirbet Ibiziq is comprised of Bedouins seeking water and pasture. The number of Bedouins living in the village is more than 256, including 16 families living in the area permanently, with the rest in a mobile state. It is worth mentioning that dozens of Palestinians, including children, have been killed or injured, after encountering explosives, dropped by the soldiers during training.